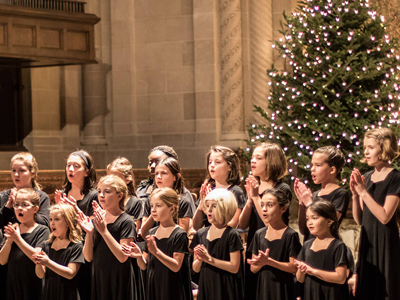 The Pittsburgh Girls Choir (PGC) presents its holiday concert, sung by all five ensembles. The concert opens with the PGC’s premier ensemble, the Chamber Choir, performing Chiara Margarita Cozzolani’s “Ave Regina Caelorum” (1642) and Rebecca Clarke’s “Ave Maria” (1937). The PGC training choirs will then delight the audience with their pure young voices as they welcome in the holidays with “Cornish Wassail.” The concert’s featured work, Britten’s Ceremony of Carols (1942), has become a PGC favorite for our audiences and singers alike. Other highlights include all five choirs singing the moving “Chanukah Prayer for Children” (Ryan Brechmacher) and joyous “Ding Dong Merrily on High” (Stephen Mager). Tickets are available online here and at the door.